Earlier today Putin outlined a 7-Point Peace Proposal. The primary conditions on Mr. Putin’s list are that the separatists halt all offensive operations and that Ukrainian troops move their artillery back out of range of cities and large towns in the rebel-held area. Mr. Putin also called for Ukraine to cease airstrikes; the establishment of an international monitoring mission and humanitarian aid corridors; an “all for all” prisoner exchange; and “rebuilding brigades” to repair damaged roads, bridges, power lines and other infrastructure. Notice that Putin did not demand any territory. Instead, he has proposed a federation in which Eastern Ukraine would remain part of Ukraine. He also insists, and rightly so, that he cannot force the rebels to do anything. However, Putin's plan was immediately slammed by Ukraine's prime minister Arseny Yatsenyuk who stated "Putin’s real plan is the destruction of Ukraine and the resumption of the U.S.S.R. The best plan to stop Russia’s war against Ukraine would be if Russia withdraws their regular troops, mercenaries and terrorists from Ukrainian territory — then peace will be reinstated in Ukraine." Clearly Yatsenyuk is living in fantasyland. Russia is not going to bow down to Ukraine under any circumstances. Dmitri S. Peskov, the Kremlin’s press secretary, said separately that Russia could not negotiate a cease-fire because it was not a party to the conflict, but that the opinions of the two presidents overlapped. Vladislav Brig, the head of the political department for the rebels’ Ministry of Defense in Donetsk, said in a telephone conversation that combat operations were continuing as usual on Wednesday. So... Ukraine wants the rebels to lay down arms and the rebels want Ukraine to do the same. Has anything really changed? The answer is yes. Talk between Putin and Ukraine is good. The answer is not more war. What's needed now is talk with the rebels and ousting Ukraine's prime minister. 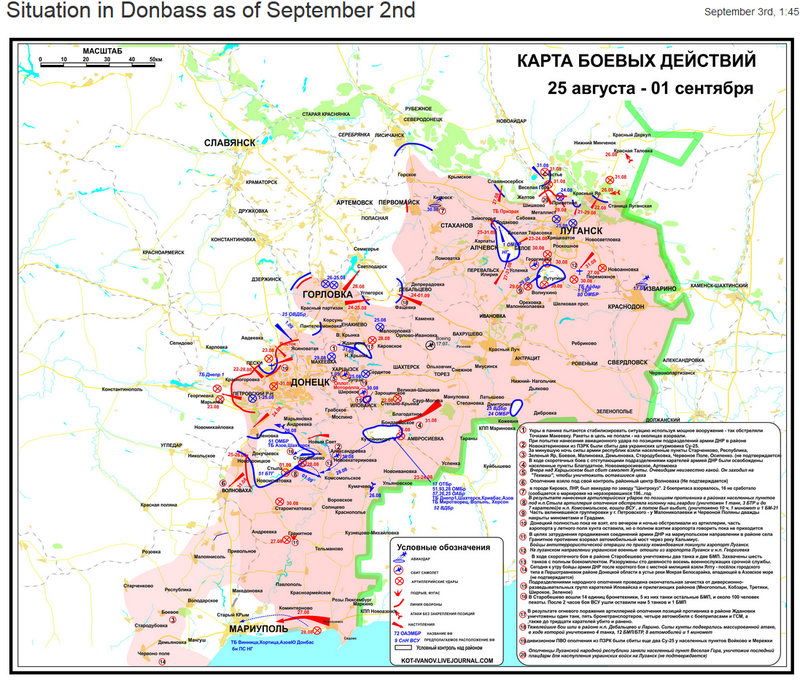 If the plan is not accepted, rebels are likely to take Mariupol. The city is now surrounded as the the following map shows. For excellent images and commentary, please see Colonel Cassad English Live Journal. Amid the above peace proposal comes the latest ridiculous lie, this one spread by the Guardian: Thousands of Russian soldiers sent to Ukraine, say rights groups. According to Valentina Melnikova, head of the Committee of Soldiers' Mothers, the main organization representing the troops' families, between 10,000-15,000 troops have been deployed to Ukraine in recent weeks. "I am convinced I am right," she said, adding that her calculations were based on information from families whose husbands and sons were sent on drills close to the border, but had subsequently gone incommunicado. Got that. Russia puts troops on the border. They are instructed to keep silent (standard military procedure), and voilà, 15,000 are presumed to be in Ukraine. Please consider France Halts Delivery of Warship to Russia. President François Hollande halted the delivery of the first of two warships to the Russian navy on Wednesday, the clearest sign yet that the west was preparing to take further punitive action against the Kremlin despite claims by Vladimir Putin he was pursuing a ceasefire in Ukraine. French officials emphasised they had not cancelled the deal, a move that could lead to as much as €1.1bn in fines for breaking the contract. Apparently they did not cancel the deal, they just won't fulfill it. This one could be headed to court. Given that Russia does not need more warships, Putin would be wise to take the fine (if he can get it) and cancel the deal himself. There is 0% evidence that sanctions ever do any good, and crystal clear evidence that sanctions harm both sides, but that does not stop the mad-hatter sanction proponents. The Brussels Blog has details from a Leaked Russian Sanction Paper. Sanctions include boycotting the 2018 World Cup to be held in Moscow, and another round of economic sanctions and export bans. Earlier today President Obama gave a speech in Estonia: NATO Will Defend Estonia, Latvia, Lithuania. Here are a few snips. And just as we never accepted the occupation and illegal annexation of the Baltic nations, we will not accept Russia’s occupation and illegal annexation of Crimea or any part of Ukraine. As free peoples, as an alliance, we will stand firm and united to meet the test of this moment, and here’s how. First we will defend our NATO allies, and that means every ally. In this alliance there are no old members or new members, no junior partners or senior partners. They’re just allies, pure and simple, and we will defend the territorial integrity of every single ally. We’ll be here for Estonia. We will be here for Latvia. We will be here for Lithuania. You lost your independence once before. With NATO, you will never lose it again. How many times has Russia been invaded by France and Germany? How many Russians died when Hitler invaded Russia? How is it that Russia came to occupy the Baltic nations and East Germany? Who reneged on promises to not expand NATO in Eastern Europe? Who fomented the overthrow of Viktor Yanukovych, former president of Ukraine? Are sanctions working in Iran or are they stirring up resentment? Did force achieve any positive results in Iraq? Has US meddling ever made anything better? The answer to question number two is 25,000,000. For details, inquiring minds may wish to consider the BBC report Hitler's Invasion of Russia in World War Two. Inquiring minds may also wish to consider Napoleon’s Disastrous Invasion of Russia, 200 Years Ago. Earlier today Pater Tenebrarum at the Acting Man blog pinged me with a report "NATO planning 'rapid-deployment force' of 10,000 troops to counter Russia". "NATO keeps provoking the Russians, but we are being told it is the other way around. If you look at the entire history of this, it soon becomes clear that the Russians only react. Your post Cold War About to Turn Hot? summarizes things quite nicely actually. Treating Russia like some third rate nation and making an enemy of it has to be one of the most moronic Western policy decisions ever." A headline on the Financial Times caught my eye today: NATO Hostility to Test Russia's Resolve. To be more precise the headline actually said "Russia Hostility to Test NATO's Resolve". Realistically, which is more accurate? Yet, here we are, possibly on the verge of a major war in Europe, with massive economic and geopolitical implications, and people would rather sit back and be spoon fed lies while wondering if the next 50 points in the S&P is up or down.